Our composite insulated roofing sheets are a quick and effective solution where heat loss is a factor in your building. U-values can easily be achieved to meet current building regulations. The single panel system is very quick to install and could provide great savings on labour costs. These sheets also eliminate condensation problems. 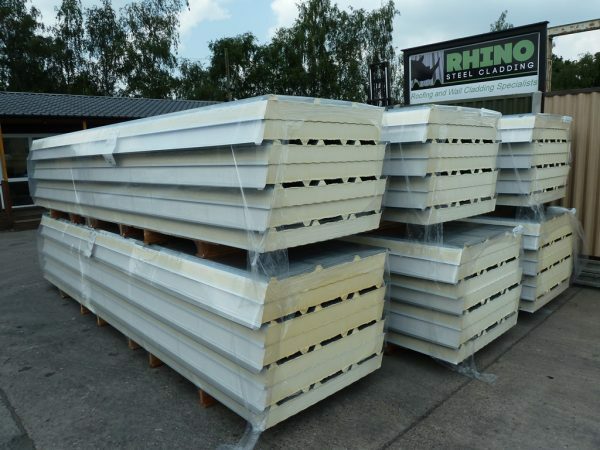 Trisomet 333 profile sheeting consists of a 0.4mm liner sheet and a 0.5mm top sheet bonded together with insulation. We have a variety of thicknesses available (40mm, 60mm, 80mm, 100mm and 120mm). Sheets are available in all standard colours. There is a minimum order of 100 metres on this product. Please enter your required sheet length in metres (in 0.1m increments) – we can supply sheets in lengths from 2m up to 10m.